As I said last week, the consultation on the Site Specific Allocations Document deadline is today, February 5th. The Planning Officer explained last week that a statutory notice was published in the Wandsworth Guardian and a few posters displayed in some estates. “Unfortunately” the Council missed the deadline for Brightside! However, regarding the poor handling of the consultation it was said that any submission post-deadline could be considered. Forms can be found in local libraries. You can also contribute directly on the Council’s website HERE. I have managed to draft a submission that you can download in full HERE (pdf). It is clear to us that the location of Clapham Junction is unsuitable for tall building and the erection of high rise development will bring a detrimental impact on the neighbourhood and will destroy the human-scale/village feeling of the area. The Council has already acknowledge that point in the Core Strategy document as amendment was made (Policy PL13 – Clapham Junction and the adjoining area – page 198, clause e) to remove reference to the Clapham Junction Station site being potentially suitable for tall buildings. However the SSAD currently describes areas with words such as “tall buildings may be justified in this location”. The Clapham Junction Action Group does not consider that the borough’s evidence supports a justification of any of tall building locations as justified. Density (that can be justified with the PTAL rate of Clapham Junction) and tall buildings are two different concepts. 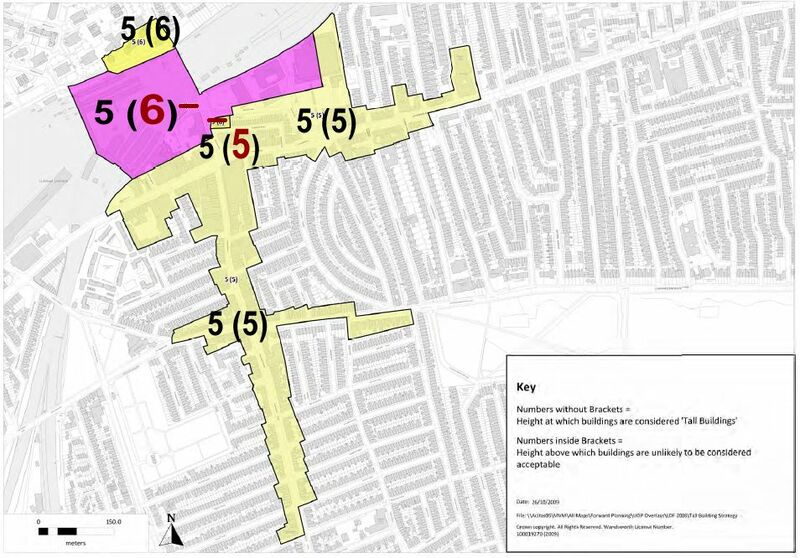 Therefore, as it is still apparent in the SSAD, we recommend that the proposed size limit for Clapham Junction area be limited to 5-6 storey (below the size of Arding & Hobbs rotunda) maximum and taller buildings (6 storeys) be located along the railway. Preferred option: Residential Mixed use development to capitalise on the existing excellent rail connections into and out of London which will be improved even further by the East London Line extension and encourage one or more major employers to base themselves in this Town Centre; other appropriate uses include business, hotel, cultural, leisure and entertainment. Alternative Options considered at Issues and Options stage: Residential only redevelopment, office only redevelopment. During the public hearing on the Core Strategy examination, Thursday 4 February at the Town Hall, the inspector made the point that developers will look at any suggested maximum and see it as the green ligh t from which to start. The point was made also about the recommended proposals / current approvals breaching them. Inspector asked for clarification of the time lapse between the old UDP and the new LDF. We can agree on only one aspect of your own comments and suggestions in that it appears that the publicity of the consulation was sadly lacking. As it happens and in relation to known clients we have made comments but its probable that many significant land owners did not receive notice of the exercise and will have been disadvantaged by the poor publicity. I don’t really see why you suggest that if a height is given as a maximum then developers will start at that point. It will depend on a large range of factors, but clearly economics do play a big role. Nothing happens if people don’t make a profit out of it. I think specifying a maximum height will remove some of the doubt that investors have and will enable alot of wasted time and money to be avoided. I think your suggested building heights are way below the mark personally but we will see. Maybe you would prefer cottages to go with your village, with the charming besmocked rustic leaning over the wicket gate, clay pipe firmly gripped in the yeoman jaw. As somebody who has lived in CJ, and worked in the Borough for around 40 years, but now lives in a real village I think it’s pretty naive to link the largest railway station in Europe to a village. There’s no way CJ is a village! We agree that it is an urban community. Even Estate Agents (now more trusted than bankers) wouldn’t call CJ a village. I know that you are making humour saying I’m talking of cottages (cottages of 6 storeys?). I have lived in villages for 15 years before and I know what “village” atmosphere means. It’s like talking about the HEART of Battersea without being a surgeon. Most of the current buildings are 4-5 storeys at maximum, often 2-3. Is suggesting 5 going back to cottages? Is trying to conserve (as in the meaning of Conservation Area) the vicinity an outdated concept? Is considering the view of the vast majority of local residents who made the effort to comment unwise?